The 170th Manchester derby was a dull affair, even lacking the gloss of a blue and red paint drying competition, bereft of any deft finishing strokes. 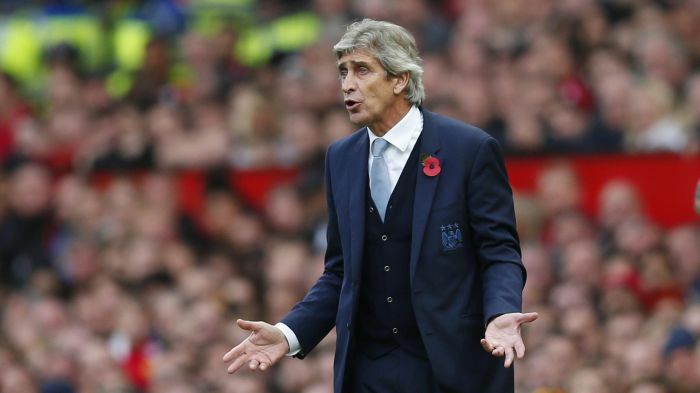 Grey, drab colourless, the 0-0 stalemate did however reveal that Manuel Pellegrini is prepared to dip into a more varied pallete when looking at the bigger picture. The Chilean ‘Engineer’ has built his managerial reputation on producing masterpieces of attacking football, with City outscoring their Premier League rivals during his two year tenure at the Etihad. With his canvas stripped back by the absence of Aguero and Silva, a pragmatic Pellegrini sacrificed his usual quest for football artistry, replacing it with a more contemporary defensive design. How many times has the City boss been lambasted by critics and City fans alike for an alleged lack of tactical nous and a gung-ho approach, especially in the Champions League? How often has the wily South American been accused of never knowing when to shut up shop and sacrifice his swashbuckling attacking style? And yet, here it was on display in The Swamp for all to see – an impenetrable wall of sky blue and white – with Nicolas Otamendi partnering Vincent Kompany for the first time, and City’s ‘F’ factor of Fernandinho and Fernando feverishly going about their work. Admittedly less attractive, but equally effective, it adds a new dimension to The Engineer’s toolbox, as his team face up to three competitions in seven days. The draw was City’s first in the Premier League since February, when a last gasp James Milner free kick salvaged a point against Hull City at the Etihad. Pellegrini certainly won’t be making a habit of seeking to neutralise opponents at the expense of going for a win, but with a tricky trip to Seville next Tuesday it can’t hurt to have options. 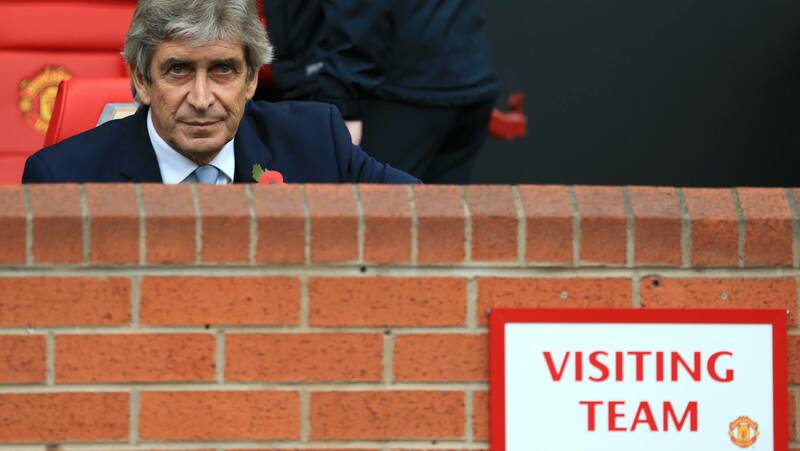 Such an occasional ‘blot’ on Pellegrini’s playbook would quickly be forgiven if it delivers the right results. All to often Manuel has been denounced for not having a Plan B. 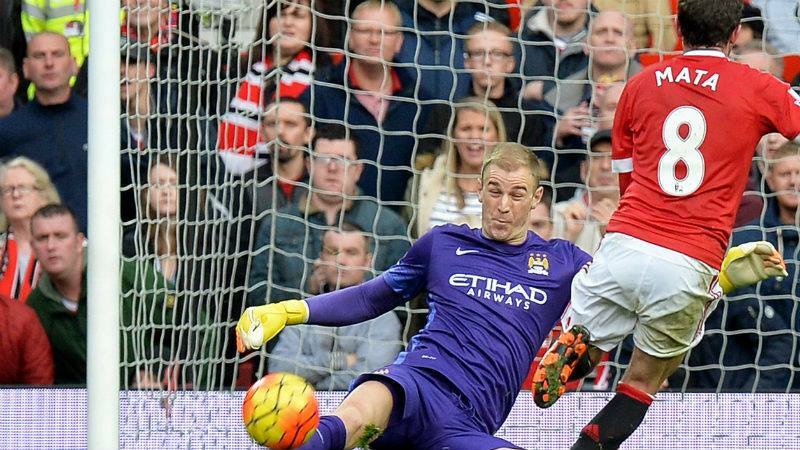 Man of the Match – Otamendi was immense in his first Manchester derby. It’s a measure of modern day City that an away draw, against a nigh-on full strength Trafford Troglodytes, is greeted with disappointment. Replacing Mangala with Otamendi to accommodate the return of Captain Vincent Kompany, may have appeared harsh on the vastly improved French defender, but it proved masterly from Manuel. Outnumbered – KdB was closely marked by a possee of United defenders. The Argentine – making his Manchester derby debut along with Sagna, Sterling, DeBruyne, Bony and eventually, Iheanacho – was immense, and deservedly awarded Man-of-the-Match recognition. 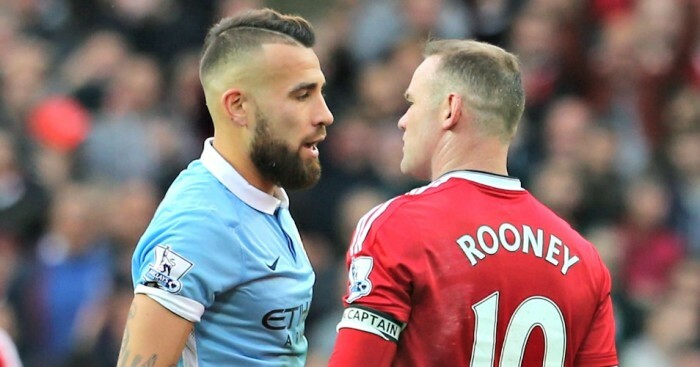 Whinging Wayne Rooney – just turned 30-years old – tried to out-muscle City’s £30m man, but Otamendi had his measure in any Argy-Bargy. Hair-raising – 30-year old Rooney had no answers when it came to getting past City’s Number 30. Earlier in the game Rooney’s head ‘inadvertently’ came into contact with Kompany’s chin resulting in a gash to the United skipper’s bonce. 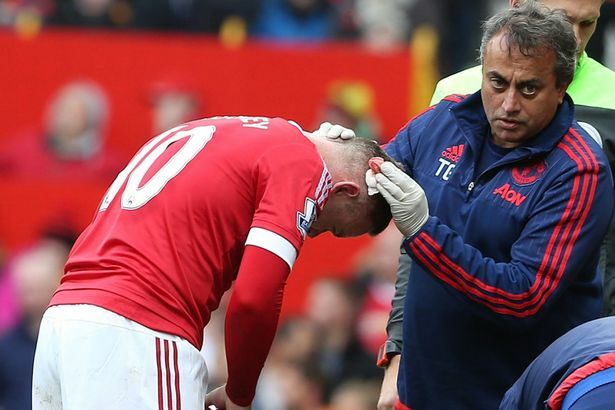 Bloodstained and with staples being inserted into his cranium, much of the terrace and social media talk centred on whether Rooney was, quite literally, getting his hair off. Can you see the join? Rooney’s hair transplant remained intact after coming off worse in a clash with Kompany. Old Big Head himself LVG, defended his team’s inability to beat an under strength City, making a fatuous penalty claim after Hererra ran into Sterling. Even rabid red Gary Neville, commentating for Sky TV, immediately dismissed it as a ‘tangling of legs and no penalty’. Funny how Van Gaal didn’t draw attention to Rojo’s cowardly raking of Navas’ face with his studs, an incident either missed or ignored by referee Clattenburg. 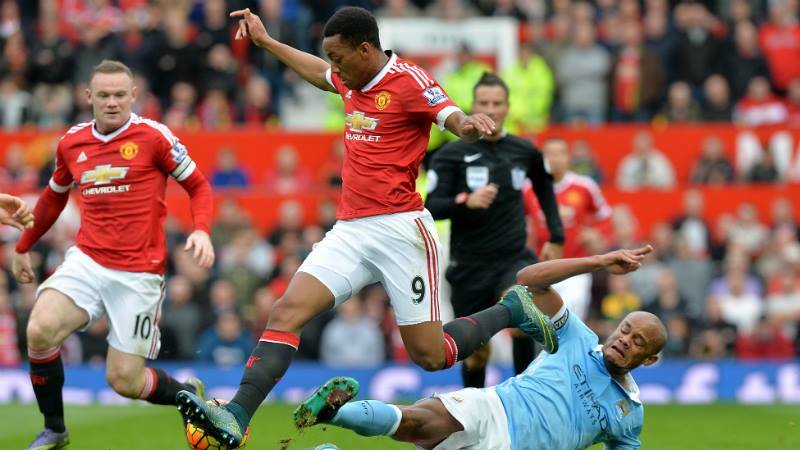 Dirty Red – Rojo raked his boot down the face of Jesus Navas and escaped punishment. The Spanish winger had replaced a worryingly inconsistent Sterling in the 55th minute. Pellegrini’s most telling substitution was withdrawing an out-of-sorts Yaya Toure, only two minutes after Bog Brush, Microphone Head, Pubic Hair Transplant Gone Wrong, ‘Gob On A City Player’ World Spitting Champion, Fellaini entered the fray. Martin Demichelis came on to counter the elbows and menace of the one Belgian all City fans love to hate. 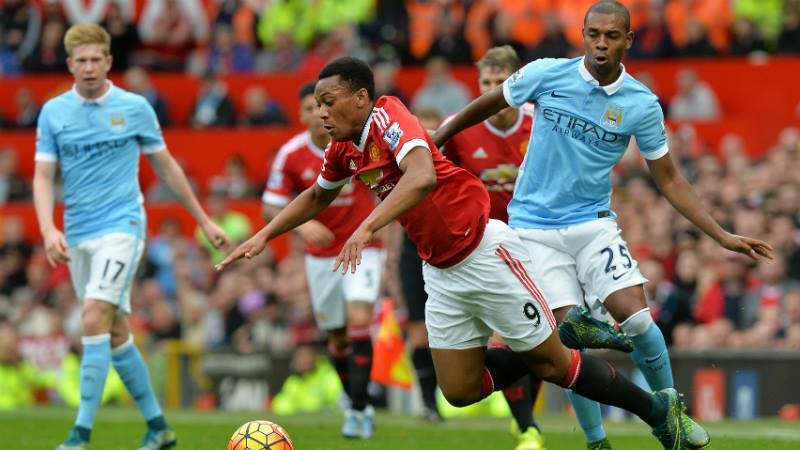 Tactically savvy – MP called it right in Trafford Borough with out injured stars Aguero and Silva. By contrast, Kevin de Bruyne, had a quiet game by his own recent standards, often being the centre of attention for two or three United players all at once. Short on confidence Wilfried Bony had a tough time, incurring the wrath of some frustrated City fans, but the big Ivorian is only likely to score if he receives the ball deep in opposition territory. The service he received was akin to that of an Argus collection point on a busy weekend…abysmal. 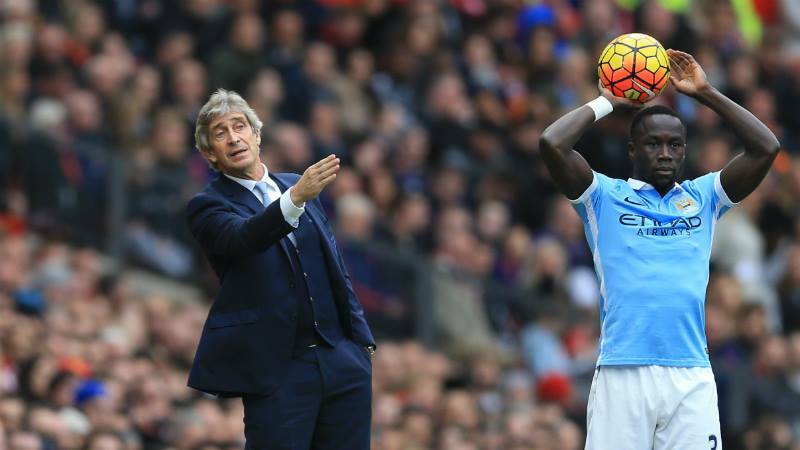 Patience and perseverance will see Bony scoring goals for City, especially in Aguero’s absence. He needs game time and a consistent supply line. Joe Hart’s late stop of a Chris Smalling shot took the keeper to a personal milestone of 100 Premier League clean sheets, the first for City since winning 1-0 away at Crystal Palace. Palace are next up in the Capital One Cup, a game that will probably see a few changes with Zabaleta, Mangala, Demichelis, Iheanacho and even young attacker Patrick Roberts start. Worryingly it will also see Willy Caballero make a rare appearance – not rare enough for many of the fans. The veteran Argentine was supposed to provide genuine competition for Joe Hart after a strong showing in La Liga. In truth young Angus Gunn would probably be a safer bet as the reserve keeper. 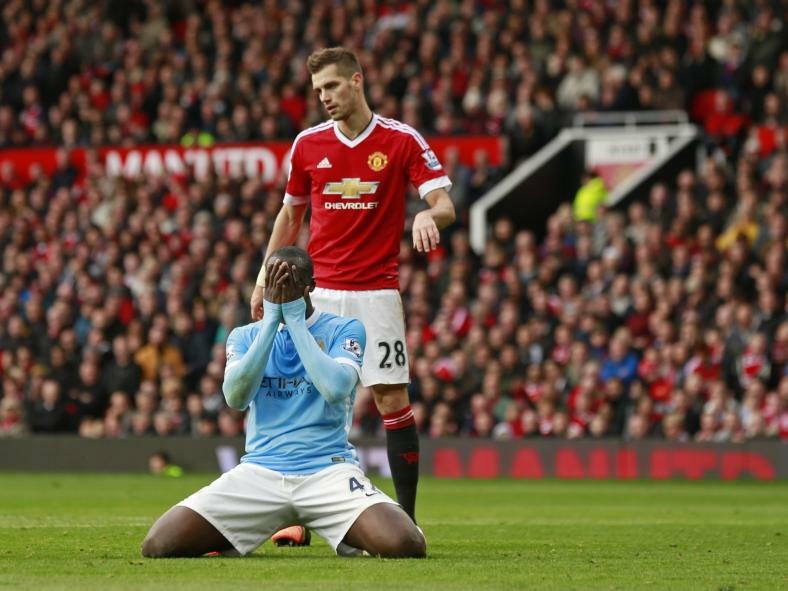 Near miss – Yaya came agonisingly close to giving City the lead. City’s clear priorities – as always – are the Premier League and Champions League, but with Aguero, Silva, Nasri, Delph and Clichy sidelined, the options to rotate the team are limited at present. Maximum points against Norwich and even a draw in a hostile Ramon Sanchez Pizjuan Stadium in Seville, would see City resolute and defiant in the face of adversity. Close call – City could have been 2-0 down to Sevilla at the Etihad before finally winning 2-1. Whether El Mago Silva might be in contention for a place against Sevilla is debateable. It’d be a huge bonus, providing City don’t rush him back too soon. Aguero – after being ruled out of Argentina’s World Cup qualifiers against Brazil and Colombia next month – is setting his sights on a return against Liverpool on November 21st. If Pellegrini deploys the tactics and formations to keep City on top of the Premier League and progressing in a fiercely competitive Group D, just imagine the boost to City’s fortunes when his primary goal maker and taker return. It’ll be anything but dull. Win signed photos of City heroes from the famous 6-1 drubbing of United four years ago. One lucky winner will be drawn at random and receive the David Silva & Mario Balotelli autographed images. All you have to do is tell us who are the new sponsors of Read But Never Red and what is their website address? The competition closes at midnight on Wednesday, October 28th, 2015 . The winner will be notified via social media and announced on the RBNR website, Twitter and Facebook accounts. Win this David Silva signed photo from the 1-6 Old Trafford massacre. 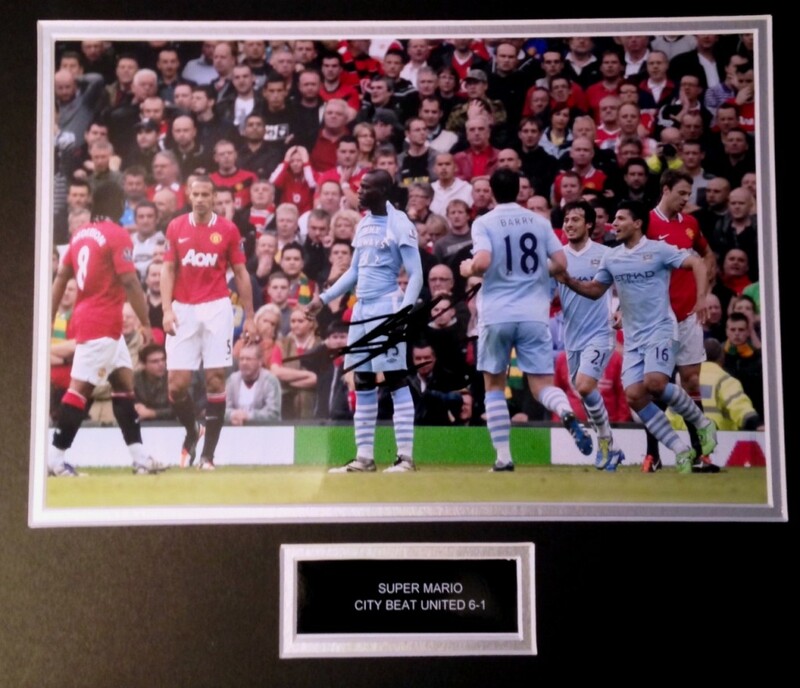 Win this Mario Balotelli signed photo as he began the famous ‘Sick Swan’ for City against United. Bit of a drab game but we were solid enough and never looked like conceding apart from their lucky crossbar flick on. From our chances, Yaya missed an opportunity but Otamendi had the best one running onto the ball only to be put off by the great Ogre himself. Thought Bony did well 1st half and criticism a bit harsh seen as though Sterling did absolutely nothing apart from his deflected effort, that is more concerning for me. Good observations on Bony and Sterling. I think both are more than capable of coming good this season. Bony has had injuries, malaria and no prolonged run in the team, whereas it's easy to forget Sterling is still only 20-years old. Gary Neville "drooled" over the game whilst most people thought it was about as exciting as a repeat of Bargain Hunt. "You're supposed to be at home"
LVG is wobbling and warbling because it isn't happening for him and his team are as dull as ditchwater. If City can progress against Palace beat Norwich and Villa in the Prem - we really should be doing so - and not lose in Seville, it'll have been a great run without our two finest players. Great and fair report as usual Dave. MP got it right on the day. There would've been a time that a point at the swamp would have been fantastic. We took the point because of a lack of fire power up front and because WE CAN!! How times have changed. Let's go and roast Delia's little chickens this weekend and establish our dominance at the top of PL. Thanks AK47...you obviously don't have the recipe for Canary Hotpot! See you guys at the Etihad. Thanks for feedback Doug. Take another look at that email address for our sponsors! 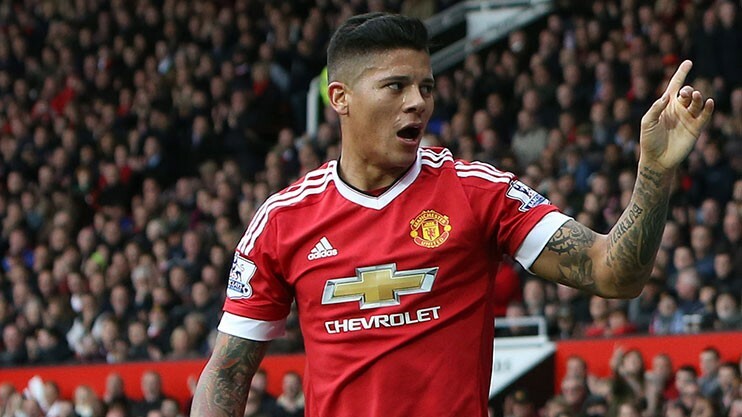 Don't understand why no FA review on Rojo...but there again, it is Manure isn't it? I will join you in prayer! Cheers Pete. Thanks for feedback and taking part in the competition.